The brain has incredible power to shape our choices, and in turn, our bodies — and much of that happens beyond our conscious awareness. The creators of most weight loss plans are experts in nutrition and exercise physiology and have wonderful insights into the human body. But they do not necessarily understand how the mind works. If your brain is not engaged in creating your ideal shape, any weight you lose will eventually come back — plus a few more pounds. The internal mental processes that guide our choices and actions can be very complicated. In fact, scientists believe that up to 80% of our thoughts and actions are dictated at the subconscious level. This is why it’s so important to program your mind to work with you toward your health goals, at all levels of consciousness. 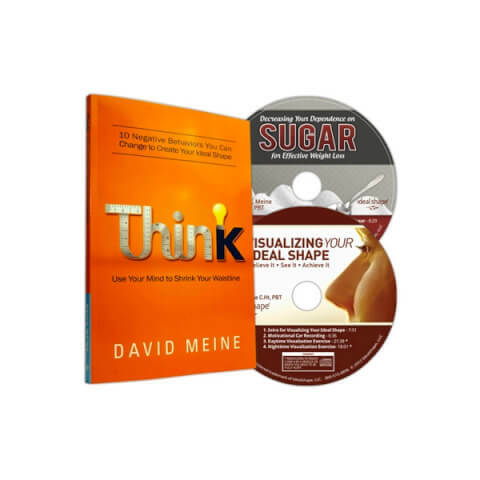 Reading the Think book combined with our hypnosis CDs will help you to focus on each of these behaviors as you find your ideal shape. You will learn how to identify and visualize your ideal shape. You will learn how to drink water more frequently and use it to relax. Stress causes many of us to turn to food for comfort and this CD is the first step in learning to manage stressors and funnel them into more positive outlets. With our Deep Sleep CD you will learn how sleep difficulties can be caused by stress and poor nutrition. "Deep Sleep for Effective Weight Loss" will help you fall asleep faster, stay asleep, and ensure a deep, restful slumber. With our Get Motivated CD you will see why many people put off exercise because they have misconceptions about what it takes to see results. In fact, the best way to start is by committing to just 30 minutes of movement, three times a week. That’s right. For a few walks in the park each week, you can start to cut your risk of cancer, heart disease and diabetes. You can regulate appetite and stress levels, stand a little straighter, and even fill your days with more strength and energy.